Millions of years to form the Grand Canyon? Not at all! 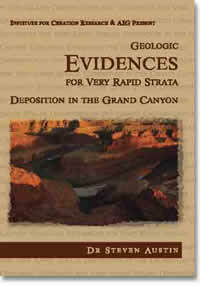 The strata exposed at the Grand Canyon documents the story of the history of the ground beneath our feet. Strata, fossils, faults, erosion, and volcanoes reveal the catastrophic Flood of Noah's day at Grand Canyon. While these geologic formations continue to baffle those who believe the Canyon took millions of years to form, Dr. Austin shows how the evidence points to rapid formation by catastrophic, rushing water. About the speaker: Dr. Steven Austin has earned a Ph.D. in geology from Pennsylvania State University. A full-time scientist with the Institute for Creation Research, he has participated in professional, peer-reviewed studies at Mount St. Helens and the Grand Canyon. In 1999 he published research in the prestigious International Geology Review. Currently Dr. Austin is researching: mass kill of nautiloids within the Redwall limestone of Grand Canyon, radioisotopes of Grand Canyon rocks, and earthquake destruction of archaeological sites in Jordan. This page was last modified on 15 July 2009, at 22:15.